Save 10% Off this Tour - Guaranteed! Only with AffordableTours.com will you save $600 per couple ($300 per person) on all 2019 Luxury Gold Journeys. Plus as always receive our AffordableTours.com 10% extra savings! Offer applies to new bookings only who book between April 1 - 30, 2019 with travel from April 1 through December 31, 2019. Promotion is combinable with Military Discount and Small Group Journeys. Not combinable with Red Hot Deals, up to $900 air offer or Early Booking Discount. Standard policies apply. Offer may be withdrawn without notice and may not apply to all vacation packages. Additional restrictions may apply. Save up to 10% with your Early Booking Discount plus receive our 10% AffordableTours.com everyday savings. Early payment savings reflected on website price. Maybe combinable with other offers, ask your travel consultant for details. Offer applies to new bookings only, does not apply to all vacations and departure dates. Full payment must be made by March 31, 2019. Savings vary by itinerary and are subject to change and subject to availability. Discount applies to land only portion of vacation. Offer is capacity controlled. Additional restrictions may apply. Young travelers between the ages of 5 through 17 yrs of age save up to 10%, plus receive our AffordableTours.com 10% extra savings! Not all vacations may qualify and/or some discounts may vary depending on departure, please ask your Travel Consultant for full details. Must be aged 5–17 at time of travel and accompanied by at least one adult sharing a twin room. Discounts are limited to one per room. Excludes train and/or cruise portions of trips. Does not apply to Egypt, South Africa, India, Japan, Australia or New Zealand trips. Discounts and savings only apply to the land portion of your vacation and are not applicable to extra nights’ accommodations, optional extensions, airfares, taxes and fees, flight supplements, surcharges and airport transfers. Sometimes more than one discount can apply. Eastern Mediterranean trips may have additional restrictions. What is better than traveling with your family and friends, why of course that is saving with your family and friends. Your group can save up to 5% when 5 to 15 guests are traveling on the same booking. Plus as always receive our AffordableTours.com 10% extra savings! Not all vacations may qualify, ask your Travel Consultant for applicable vacations. Family and groups save up to 5%. Available when 5-15 guests are together on the same booking. Discounts and savings only apply to the land portion of your vacation and are not applicable to extra nights’ accommodations, optional extensions, airfares, taxes and fees, flight supplements, surcharges and airport transfers. Sometimes more than one discount can apply. Eastern Mediterranean trips may have additional restrictions. Family and group discounts do not apply to South Africa, Asia, Egypt, Australia, New Zealand or India journeys, nor to any cruise portion or the Rocky Mountaineer Train. Save up to $315 when you book two Luxury Gold trips of seven days or more and save on the lower priced trip. Take three tours and save on two. Plus receive our AffordableTours.com 10% extra savings! Not all vacations will apply, ask your Travel Consultant for full details. If you have traveled with Luxury Gold, Insight, Trafalgar, Brendan, African Travel, Contiki or Uniworld in the past you may be eligible for up to a 5% discount on the land portion of your next trip, plus receive our 10% AffordableTours.com additional everyday savings. Contact your Travel Consultant for applicable vacations, not all vacations will qualify. Experience the very best of Cambodia and Vietnam, as you marvel at some of the world’s most important ancient monuments, journey through majestic countryside and feast on exotic flavours. Stay in the finest luxury hotels, cruise along an island-dotted emerald bay and enjoy VIP access to iconic attractions. Day 1 - Arrive Siem Reap. Accommodation: Angkor Phokeethra Golf and Spa Resort, Siem Reap. Day 2 - Angkor Wat in Style. Day 3 - Dynamic Ho Chi Minh City. Accommodation: InterContinental Saigon, Ho Chi Minh City. Day 4 - Marvels of Saigon. Day 5 - Cruise the Mekong Delta. Day 6 - Royal Refinement in Hue. Day 7 - Highlights of Hue. Day 8 - Romantic Hoi An. Accommodation: Anantara Hoi An Resort. Day 9 - The locals in Hoi An. Day 10 - Hanoi street-food tasting tour. Accommodation: Hotel de l'Opera Hanoi. Day 11 - Cruise along Ha Long Bay. Accommodation: Jasmine Cruise (Superior Cabin), Ha Long Bay. 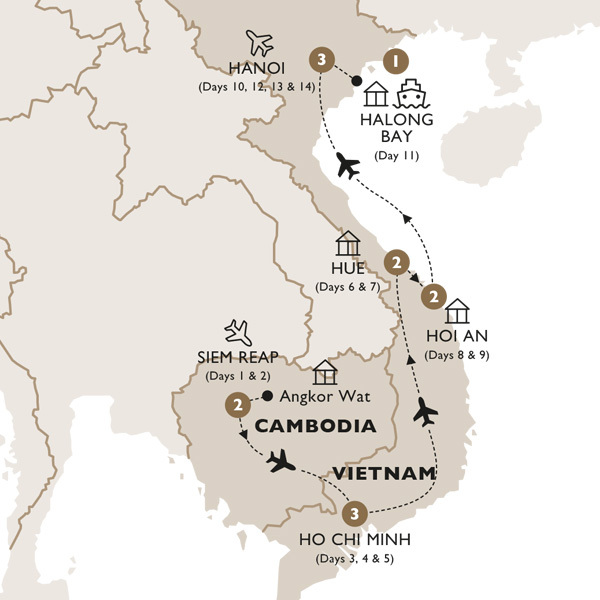 Day 12 - Ha Long to Hanoi. Day 13 - The Temple of Literature. Day 14 - Farewell Vietnam. Siem Reap: Join your Travelling Concierge and fellow travellers for your Welcome Dinner. Ho Chi Minh: At the Art Salon Saigon, you will enjoy a Highlight Dinner set in a sophisticated atmosphere and accompanied by live music. Ho Chi Minh: Learn about local street-side cafe culture and gain an appreciation as you enjoy a cup of Vietnamese coffee. Mekong Delta: Enjoy freshly-made Mekong delta specialties for lunch. Hue: Join your fellow travellers and sit down to a delicious meal, accompanied with wine, at a local restaurant. Hue: Visit the 18th century Dong Thuyen Pagoda and dine on an organic vegetarian lunch prepared by Buddhist nuns. Chat to them and learn about their beliefs, practices and food philosophies. Hoi An: For a Your Choice Evening, choose from one of three hand-selected restaurants, each specialising in different cuisine from traditional to modern Vietnamese, or an east-meets-west fusion. Hoi An: Meet a local chef who will lead a hands-on cooking class and learn how to create some of the local specialities that you will enjoy for your Highlight Lunch. Hanoi: Join a passionate foodie on a walking tour to some of the city’s most interesting areas and experience the vibrancy of Hanoi's street-food culture. Taste local treats, such as rice paper rolls, pho bo which is beef noodle soup and com cake. Dining Summary: 13 Breakfasts (B), 4 Lunches (L), 1 Lunch with Wine (LW), 2 Dinners (D) and 5 Dinners with Wine (DW). Siem Reap: More than just a circus, the Phare Circus is transforming the lives of disadvantaged young Cambodian performers through theatre, music, dance and modern circus acts. See them in action, as they tell unique stories of Cambodia on a dazzling stage. After the show, meet one of the performers to hear how their lives have changed since joining the circus. Siem Reap: Enjoy a short flight from Siem Reap to Ho Chi Minh city. Ho Chi Minh City: Experience the vibrancy of Ho Chi Minh City, formerly known as Saigon, as you visit its most iconic attractions and learn about its street food and coffee culture. Ho Chi Minh City: Join a Viet Cong veteran to visit the underground Củ Chi tunnels and learn about their experience. Ho Chi Minh City: Enjoy a private Meekong River Cruise and learn about coconut processing. Ho Chi Minh City: Enjoy a ride on a tri-motorcycle through tropical surroundings and learn about how rice noodles are produced. Hue: Enjoy a short flight from Ho Chi Minh to Hue. Hue: Cycle through rice fields to Thanh Toan village, visit the local market and soak in the agricultural way of life. Hue: Visit the Imperial tomb of Emperor Minh Mang. Hoi An: Explore the traditional old town see the Japanese covered bridge, fruit and vegetable market and look out for the coloured lanterns. Hoi An: Ride a traditional bamboo basket boat to Thanh Dong village and learn about the village's traditional way of life. Hanoi: Enjoy a short flight from Hoi An to Hanoi. Hanoi: Ride an electric cart and see the main sights of Hanoi including the Opera House. Halong Bay: Board your deluxe junk boat for an overnight cruise to experience this UNESCO world heritage site. Halong Bay: Visit the spectacular Tien Ong cave and explore the Cua Van area. Siem Reap: The five-star Angkor Phokeethra Golf and Spa Resort places you minutes away from Angkor Wat, the National Museum and the city centre, while also offering an oasis of tranquility amidst a tropical garden. Cool off in the pool, enjoy the spa or play a round of golf. Ho Chi Minh: One of Vietnam’s leading hotels, the five-star InterContinental Saigon is situated in the very heart of the city and is a short walk from famous landmarks such as Notre Dame Cathedral and the Saigon Post Office. Enjoy your refined deluxe suite and a range of facilities, including elegant restaurants, a library and a spa. Hue: Find balance and harmony at the peaceful Pilgrimage Village, situated among leafy trees and quiet countryside. Participate in meditation, yoga or tai chi classes or unwind in the steam bath. Hoi An: Positioned on the banks of the Thu Bon River, the luxurious Anantara Hoi An Resort is situated moments away from the charming historic part of Hoi An. Take in the tranquil atmosphere from a sunbed overlooking the river, treat yourself to a massage at the spa or cool down in the swimming pool. Hanoi: Voted the best boutique hotel in Asia, Hotel de l'Opera Hanoi embodies the glamour of a night at the opera. It is situated in the centre of Hanoi, within walking distance of the Hanoi Opera House and Hoan Kiem Lake, and offers sumptuous guest bedrooms, a spa and a selection of fine restaurants. Halong Bay: The majestic Jasmine Cruise Halong Bay epitomises seafaring at its most stylish. Fitted out in the 1930s Indochina style, the Halong Jasmine features spacious cabins, restaurants, lounges and uninterrupted views of the emerald bay. Angkor Wat: Regarded as one of the world’s most important religious monuments, Angkor Wat is yours to explore alongside a renowned Khmer scholar from the Angkor Temple Conservation Institution. Wonder at the Angkor Temple and surrounding complex, see the Bayon temple, visit the Terrace of the Elephants and the Terrace of the Leper King and hear fascinating insights into the history of the Khmer Empire. As you explore Angkor Thom, imagine what life was like when Angkor was bigger than any European city. Mekong Delta: Meet Mr. Sau Tuong, a former soldier who survived four years ﬁghting the deadly Khmer Rouge in Cambodia, at his home and see how he and his wife earn a living making rice paper. Hue: Enjoy a private VIP visit to the UNESCO World Heritage Site of the Imperial Citadel, before it opens to other travellers. Learn about its traditional architecture and history from a renowned historian. Hue: Meet the headmaster of the Vietnamese Royal Martial Arts Academy and learn what it takes to become a practitioner of this standard. See a performance showcasing different martial arts techniques. Dao Thuc: Accompanied by a live orchestra, enjoy a water-puppet performance, set in a lotus pond. Meet the artisan who makes the puppets in his workshop and see how the Vietnamese have been bringing performances of this nature to life since the 10th century. Hanoi: Meet a renowned scholar at the Temple of Literature and learn about Hanoian culture and Vietnamese architecture, before touring the temple grounds. Luxury Gold is proud to offer various modes of transportation, from luxury coach to included flight to overnight cruise and more, so that you always travel in comfort and experience your journey and destination in the best possible and most appropriate way. Stay connected with friends and family with our complimentary coach and hotel Wi-Fi (where available, does not apply to Halong Bay Cruise). From time to time, your Travel Director will enchant you with a Luxury Gold Flourish, which is a local speciality representing the destination. Complimentary, private airport transfers are included on start and end dates, when flights are included within the itinerary and when additional accommodation has been booked through Luxury Gold. Note: AffordableTours.com is a travel agent for Luxury Gold. All prices, itineraries, accommodations and dates are subject to change without notice and at any time by the tour operators. All prices are USD per person and based on double occupancy. Availability is limited and must be reconfirmed at time of booking. Please call us toll free at 1-800-935-2620 to confirm availability and current pricing on all our discounted specials. The prices on this website are not guaranteed until a deposit has been made. We are not responsible for errors, omissions, or changes in these prices until a booking has been confirmed by one of our agents. Some land prices may include an internal air component and discounts will not be offered on the internal air component. Discounts will not be offered on packages with a land price of less than $500.